Since the Kurdistan Workers’ Party (PKK) formed it has gone through difficult times but never like now. The best part of PKK struggle was the period of unilateral ceasefire. That was the period when the PKK flourished and the Kurdish people in Bakur rested. It was also a very good opportunity for the PKK to focus on the towns and cities to organise itself better. That was just one of the positive things that the PKK managed to achieve during the ceasefire. In fact during this period it managed to make more contacts outside Turkey and gained support and solidarity from many leftists, trade unionists, communists, socialists and even anarchists. In addition, the PKK exploited the period to discuss and debate among its members and its supporters the social movement and the idea of rejecting the nation state. In short the PKK was on the brink of transforming itself from a military force to a social force, from guerrilla war to civil resistance and from a fighting movement to a social movement. All this progress worked very well and even Rojava benefited from it until April 2015 when Erdogan cut off all contact between Ocalan and the outside world. The period between April and June 2015, was a tumultuous and fragile period in both the Kurdish territory and the whole of Turkey. On 20/07/2015 there was a terrorist attack on the Youth Wing and the Socialist Youth Associations Federation (SGDF) gathering in Suruc that killed 33 people and injured 104. This was followed by the killing of a couple of police officers allegedly by the PKK. Erdogan and his National intelligence Organisation, MIT, welcomed this opportunity to force the PKK to breach its ceasefire and involve them in an unwelcome war. Since then, the PKK has been in crisis especially when embracing the announcement of war by the State. Erdogan launched war not just against the PKK but, in fact, against all Kurds in Turkey by increasing the level of its brutality especially after the PKK started street fighting and resisted in many towns. The PKK announced its resistance, a positive self-defence resistance, but in fact it was self-defeating and self-destroying. The State of Turkey did not stop fighting the PKK and Kurds inside Turkey, but also extended its fighting to Iraqi Kurdistan. The PKK has given a very good excuse to the State of Turkey to show its hand and destroy many towns and villages and kill whoever resisted its authority, by any means. It dismantled most of the Kurdish Municipalities that were under the control of the Peoples’ Democratic Party, HPD, and the people. Over 2000 people were killed, 11 MPs arrested including the chair and co-chair of the HDP, more than 134 members of the Municipalities arrested, around 500,000 people displaced and evacuated and Sur, an ancient town in Diyarbakir, (in Kurdish Amed) was almost entirely destroyed. Internationally, the US, UK, France and Germany blamed the PKK and insisting that it was a terrorist organisation. Their media attacked the PKK and did not cover the Turkish State atrocity against the Kurdish people, or very little coverage. In addition, Turkish jet fighters attacked the PKK base in the Qandil mountains and the villages at the foot of the Qandil daily from the outset and once or twice weekly thereafter for months. This destroyed the villages, burning and poisoning the environment and killing many Kurdish villagers and animals. This all took place before the eyes of those same European and US governments. In fact, they showed their support for Turkey whilst the Tory government in the UK still continued its arms deal with Turkey. In the end, the PKK stopped street fighting but it was too late as the war was lost with the cost of enormous damage. Surprisingly, as far as I know up to this moment, nobody in the PKK has taken responsibility for using these wrong tactics and changing their strategy. And, worse than that, those so-called supporters of Rojava and Bakur were silent about shifting the PKK to street fighting. In my opinion, since then, the PKK has been in deep crisis. Now it is facing a couple of choices. Either it needs to go back to where it was in the 1990s. In choosing this, it achieves absolutely nothing apart from more killing and further destruction of Kurdistan. Or it could simply disarm the majority of its forces and withdraw to the mountains on the border whilst announcing a ceasefire regardless of whether or not the State of Turkey agrees. This can be the first step to save their skin and then to encourage their supporters in the towns and cities in the whole of Turkey to become centres for struggle whilst building social movements. This is the only way if the PKK wants to get out of its crisis and do something better for Kurds. I believe this step may be extremely difficult for the PKK because, since July 2015, it has gone backwards instead of going forwards and has moved away from Ocalan’s principle and main aim of building Democratic Confederalism . Also, at present, PKK leaders, especially its military commanders, speak a different language to Ocalan and, maybe, from a tiny minority in the PKK as well who talk about a Kurdish state, uniting the Kurdish people and lots of nationalist rhetoric. In Iraqi Kurdistan where the PKK has a very strong military base and is ideologically strong, they have not built one single local group in the last 20 years. They have not even worked at introducing the experiment of Rojava and Bakur to the Kurdish there. They did not help their supporters in that part of Kurdistan to do anything more effective than recruiting them as fighters. For me, the PKK action in Turkey and Iraqi Kurdistan has either nothing or very little to do with Ocalan's new idea. On 23/12/2017, the top commander of the PKK, Jamil Bayik, who is also the co-chair of the Kurdish Community Council, Jamil Bayik, was interviewed by Ronahi TV about the current situation in Iraqi Kurdistan which has been in deep crisis since 2015 and saw huge protests and demonstrations between 18/12/17 and 20/12/17. He said the only solution to the crisis is “ to form a new government”. While it was a good opportunity for him to talk about the roots of the problems and solutions in line with Ocalan’s new idea of Democratic Confederalism, he knows very well that what he said is not the solution because a new government can only be formed from the current political parties while all of them are corrupted and are agents of Iran and Turkey. They have proved that political parties cannot bring prosperity and equality to their own people. On 28/12/17 Murat Karaylian, the second commander of the PKK, in his interview to Chra TV said, “ They have suggestions for the crisis that Kurdish people in Iraqi Kurdistan are facing”. He believes in forming a Commission from different sides, political parties and organisations. He suggested that the Commission could have meetings with people to find out what, exactly, they want. However, Mr Karaylian knows full well what the people want, but the problem is people do not get what they want under the KRG regime. He simply talks nonsense, instead of offering their help and support to people to organise themselves independently, just as people did in Rojava, and work towards the main gaol of Democratic Confederalism. 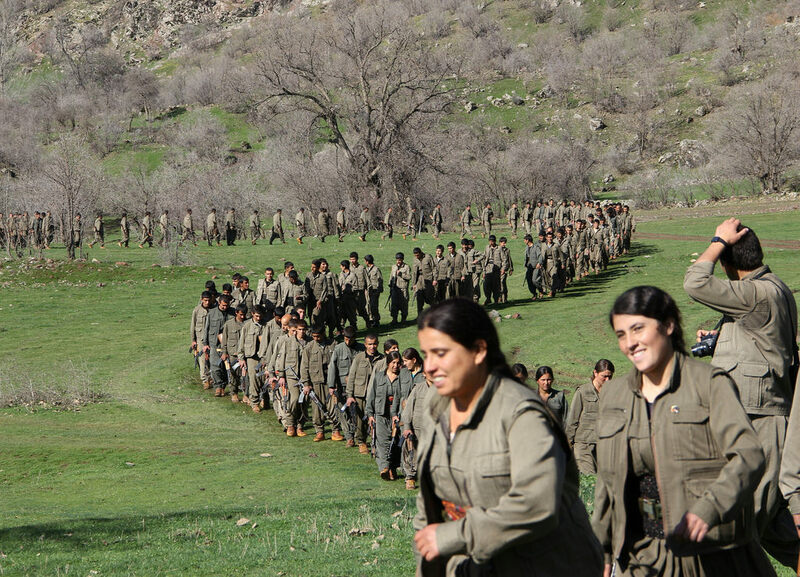 So where is the PKK heading? Answering this question is not easy but the current direction of the PKK neither benefits itself nor the Kurdish people. However, I am sure the future will answer this question, and we may not need to wait long. Thanks for writing this Zaher its good to get your perspective on developments that a lot of us have been watching and discussing.